Taiwan, 2015, 105 minutes, Colour. Directed by Hsiao- Hsien Hou. 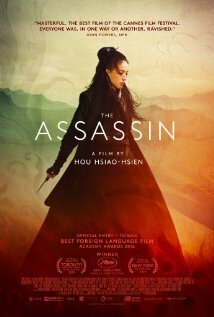 The Assassin is not the easiest film to follow, taking audiences back into the seventh and the ninth centuries, Chinese empire, rivalries and clashes and the role of the young woman who is a trained assassin, taken as a child by a nun who instructs her and gives her missions. The director is one of Taiwan’s most significant directors over several decades, making a wide range of films, contemporary and historical, relying on strong visual style, very much to the fore here in the black and white and colour photography, the composition within frames, the hold of the camera for audiences contemplative response. This means that many audiences will be disappointed, especially those assuming from the title that this is a Crouching Tiger, Hidden Dragon kind of film. It is certainly not. It does have quite a number of fights, but they are presented in a rather more realistic way rather than relying on magic realism and special effects. While there is much to consider in this glimpse of Chinese history, exercises of power, rivalries, battles and squads and assassins, the overthrowing of dynasties, this is a film to contemplate and reflect on rather than for an adrenaline experience. 2. The director, Taiwanese background, his career, perspectives in his films? 3. The acclaim for the photography, the visual beauty, opening in black and white, the seventh and ninth centuries, moving into colour, landscapes, shots and compositions, dwelling on the shops? Exteriors, mountains and beauty, the woods? The interiors? The wealth and the poverty? The musical score? 4. The importance of action, stunt work, restrained use of martial arts, the contrast with the popular Chinese films? 5. The title, the seventh century introduction, the dynasties, the empire, the passing of the centuries? Rivalries? 6. The prologue, the assassination, the splitting of the Lord’s throat? In the landscapes, black and white photography, the introduction of the assassin? 7. The complexity of the plot, audiences identifying personalities, the sides in the clashes? The women, the children? The Lords? The difference, the fighting squads, the killers? 8. The assassin, little girl, taken for training, the goals, mistakes, going into action, the initial slitting of the throat, the threats? The children and the threat? Her mission, the followers, her saving the warrior, the rescue? The woman in the fight? The end? 9. Groups travelling the countryside, the locations, the battles, ambushes, in the palaces, in the countryside? 10. The magician, the old man, the towns, the paper cutouts with the bodies of the dead, the confrontation, the arrows fired into him, his death? 11. The scene in the palace, the dancing, the man and the woman, the gases, the woman’s collapse, the fights – and the pregnancy? 12. The resolution of the plot, the future for the assassin? Riding away?